Most economical water filled barrier system in the market. Modular design allows choosing the desired length. Provides greater degree of safety than drums & cones. Tongue & groove interlocking system holds the barrier in place. Plank barriers reduce the cost by nearly 40%. Light weight, only one person required for assembly. 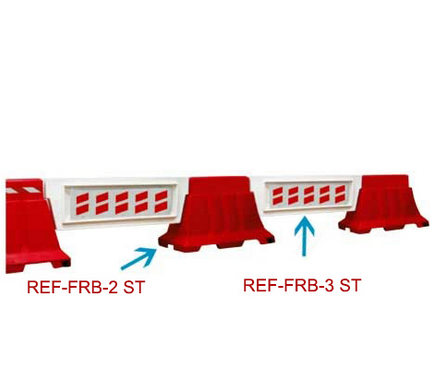 Highly visible in work areas with coloured interlocking sections in red & white. Stackability allows to transport Approx . 420 mtr. length in a 40 container. Width: 490mm / 200mm for 3 ST.